A common question I have been getting at my presentations on emotional intelligence is “how do I assess my own emotional intelligence?” Are you curious about your own emotional intelligence and how you measure up? Have you taken an online or paper-based assessment test? For my emotional intelligence workshops for project managers, I have been using the TalentSmart EIAppraisal instrument because it is fast and easily available on line. At $35, it is one of the lowest cost and most affordable assessments. Unfortunately, it doesn’t match the curriculum I am teaching for project managers. So I decided to create my own. For anyone who doesn’t want to spend $35 for a quick emotional intelligence assessment, I am offering this new EQ assessment tool at a great price. It is fast, available on line, and very affordable (OK, it’s free). I won’t even ask you to register to download it. I would ask that you provide some feedback, if possible, about whether you found it helpful or not. The unique thing about this particular instrument is that it is geared to project managers. In fact, it is the only emotional intelligence assessment tool that is developed specifically for project managers based on the competencies that are critical to project manager’s success. 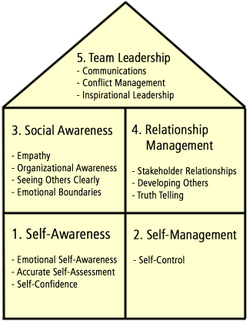 The assessment is based on the emotional intelligence framework (see right) that I adapted from Daniel Goleman’s books (Working with Emotional Intelligence and Primal Leadership) to include in my own book, Emotional Intelligence for Project Managers. This is a Beta version so I am expecting it to evolve over the next few months into something much more robust. Please give the tool a test drive and if you feel so inclined, I would love to get your feedback. If enough people find it helpful and provide constructive feedback, I will update it and make it available as an online tool that is self scoring with the capabilities to provide you with a comparison of your score to other project managers. If there is other information you’d like to know, email me or comment here.